The Number Resource Organization, the coordinating mechanism for the five Regional Internet Registries or RIRs, this morning announced that less than 5% of the world’s IPv4 (Internet Protocol version 4) addresses remain unallocated. The IPv4 pool first dipped below 10% in January 2010, and in the next nine months some 200 million addresses have subsequently been allocated from the Internet Assigned Numbers Authority (IANA) to the RIRs. NRO anticipates to allocate the last IPv4 address blocks to the registries within months. This is something that has been anticipated for years. In fact, concerns about the depletion of the IPv4 allocation pool date back to the late 1980s, when the Internet started to experience dramatic growth. You don’t think about it much, no doubt, but it is an important issue. Every host on an IP network, from servers to personal computers to networked printers, is assigned an IP address, a unique identifying number that is used to communicate with other hosts on the same network, or globally. 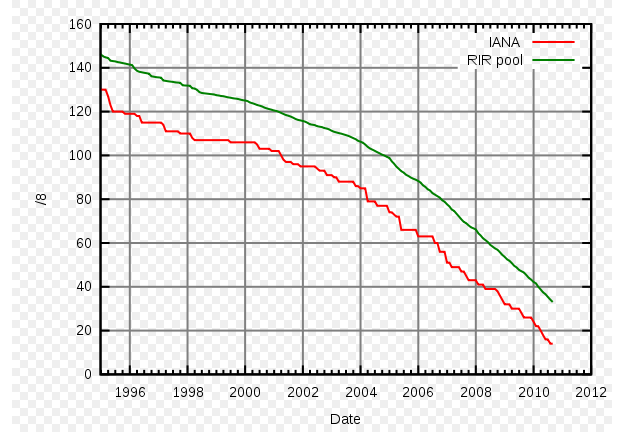 The IANA assigns IPv4 addresses to the RIRs in blocks that equate to 1/256th of the entire IPv4 address pool (just over 16 million IP addresses). The most recent assignment, two blocks for the Regional Internet Registry for the Asia Pacific region, means that there are now only 12 of these blocks available, which is less than five percent of the entire space. Axel Pawlik, Chairman of the NRO, states that it is critical for all Internet stakeholders to take definitive action now in order to ensure the timely adoption of IPv6, the next generation of the Internet Protocol. IPv6 has a vastly larger address space than IPv4. This results from the use of a 128-bit address, whereas IPv4 uses only 32 bits. In 2010, NRO expects the five RIRs to allocate over 2,000 IPv6 address blocks, representing an increase of over 70% on the number of IPv6 allocations in 2009. In contrast, the number of IPv4 allocations is expected to grow by only 8% in 2010. NRO subtly warns that without adequate preparation and action for the deployment of IPv6, there will be a chaotic scramble for the addresses, which could increase Internet costs and threaten the stability and security of the global network.